The editors of the Journal Limnology and Oceanography named Reach-scale isotope tracer experiment to quantify denitrification and related processes in a nitrate-rich stream, midcontinent United States (Bõhlke and others, 2004) one of two feature articles for their May 2004 issue. "To gain a better understanding of the role that small streams play in removing N [nitrogen] from water and preventing it from polluting downstream ecosystems, investigators are developing and refining techniques for whole-stream stable isotope additions. Such tracer experiments offer the advantage of indicating in-situ fluxes and transformations of N at ambient concentrations, at the scale of an entire stream reach. This information on N cycling also provides fundamental insights into autotrophic and heterotrophic metabolism in streams and the role of N in regulating that biological activity. The two articles featured here represent the state-of-the-art in this line of research." Hamilton, Stephen, and Canuel, Elizabeth, 2004, L&O Featured Article: Limnology and Oceanography Bulletin, v. 13, no. 2, pages 41 and 43. Nutrients, especially nitrogen, discharged to the Gulf of Mexico by the Mississippi River have been identified as the primary cause of the annual development of a zone of hypoxia in the northern part of the Gulf. Hypoxia is characterized by depressed levels of dissolved oxygen in water, which adversely affects marine life. Nitrogen is introduced to streams from diverse point and nonpoint sources, and the influx of nitrogen to stream waters has increased as a result of human activities. An additional factor is wetland loss in the Mississippi River watershed, which has reduced the watershed's natural ability to consume nutrients, such as nitrogen. As a result of both of these factors, nitrogen discharge to the Gulf has increased. What happens to nitrogen after it enters the small streams that feed the Mississippi River? What are the geographic sources of the nitrogen that persists downstream? Which areas in the Mississippi watershed are the most appropriate to invest limited resources in to reduce nitrogen loading? These are important questions. To help answer these questions, U.S. Geological Survey (USGS) scientists conducted an experiment in a nutrient-rich stream in a small agricultural watershed in Indiana to understand the fate of nitrate (the most common chemical form of nitrogen) entering streams. The experiment consisted of adding isotopically labeled and traceable nitrate to the stream and measuring changes in the distribution of the isotopes as the nitrate moved downstream. This allowed the scientists to measure directly the conversion of nitrate to nitrogen gas (N2) (denitrification) within the stream-a measurement not possible with traditional assessment methods. 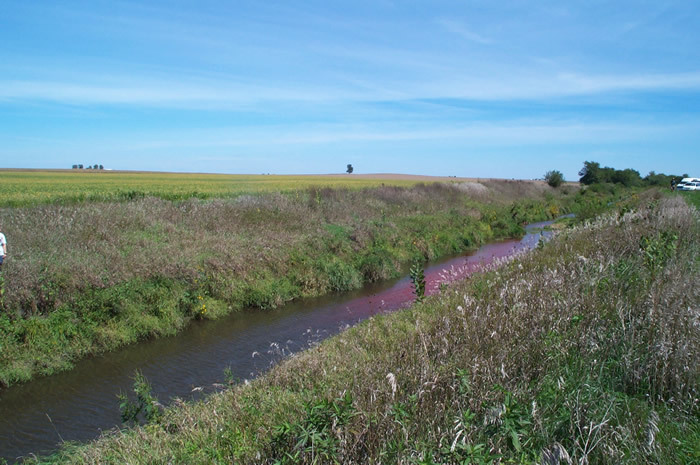 The results showed that denitrification within the stream removed a significant amount of nitrate; however, the losses were more than offset by additional inputs of nitrate along the length of the stream. This experiment showed that much of the nitrate that reaches streams in the Midwest is potentially removed by denitrification within streams, but that streams cannot remove all the excess nitrate they receive. The results of the experiment shed some light on important questions and provide policy makers with information they can use to improve local water-quality conditions and mitigate hypoxia in the Gulf of Mexico. Preliminary pulse-injection of rhodamine tracer moving down Sugar Creek, Indiana. This preliminary injection was used to guide the nitrogen isotope tracer test. USGS scientist filtering water samples for nitrogen isotope analysis during the tracer test on Sugar Creek, Indiana. Analysis of the tracer test data allowed for the direct observation of denitrification within the Creek. Böhlke, J.K., Harvey, J.W., and Voytek, M.A., 2004, Reach-scale isotope tracer experiment to quantify denitrification and related processes in a nitrate-rich stream, midcontinent United States: Limnology and Oceanography, v. 49, no. 3, p. 821-838.